So simple but so delicious, the Caprese salad (insalata caprese in Italian) layers slices of tomato and mozzarella di bufala* with fresh basil. The dressing is a drizzle of olive oil and balsamic vinegar. The salad is named after the Italian island of Capri, where it was widely popularized in the 1950s following its “discovery” by tourists. 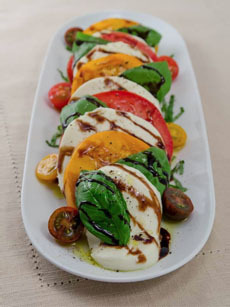 With all the gorgeous heirloom tomatoes now at farmers markets, it’s time to enjoy a daily Caprese salad. For an even more eye-catching salad, use a mix of different colored heirloom tomatoes, as they do at Balducci’s Market. *Almost all American mozzarella is made from cow’s milk. But in Italy, by law, mozzarella is made from the milk of the water buffalo, and is called mozzarella di bufala. Water buffalo milk lacks carotene, the yellow pigment found in cow’s milk, so mozzarella di bufala is pure white. Cow’s milk mozzarella is called fior di latte, “the flower of the milk.” Water buffaloes, native to Asia, were brought to Italy in the 1400s. Yellow, red and red cherry heirloom tomatoes grace this Caprese salad. Photo courtesy Balducci’s. No tomatoes? No problem! Don’t like cheese or lactose intolerant? Substitute tofu. Don’t like basil? Try arugula, spinach or watercress. Not a salad person? Have a Caprese sandwich.